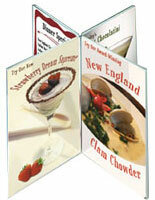 Are you shopping for a table sign for your restaurant or business? 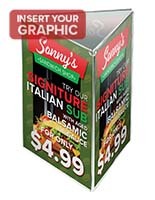 Do you find tabletop advertising to be an effective means of increasing sales? 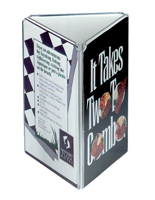 This table sign, four-sided menu display, is the preferred option for most dining facilities and other businesses. This tabletop frame is ideal for establishments that have limited space, but want to get maximum exposure for new products or services. 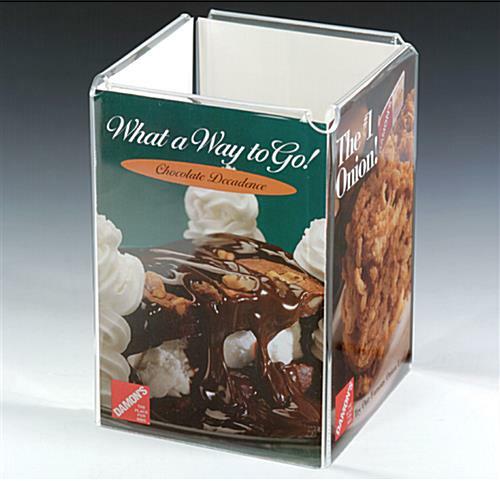 Use this table sign, menu card holder, to promote new desserts or appetizers. Guests typically have plenty of time throughout the course of their visit to look through the signage left on the tabletop. 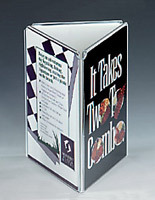 Fill this table sign with four different promotions or graphics. Another option would be to place the same advertisement in all four frames to promote in all directions. This table sign, also called a picture frame, can also be used to display family photos. 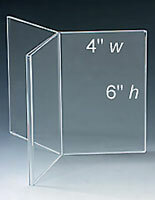 Place this acrylic display on a desk or in a cubicle to create a more personalized space. 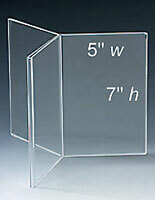 This table sign, 4" x 6" frame, is the most common size used for quick-print photos. 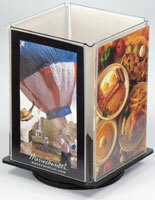 The center of this menu display is hollow, making it an ideal area to place a condiment bottle, extra napkins, or even pens and pencils. Changing out this table sign is simple through the open bottom. Simply slide out the old graphics and insert new signage. 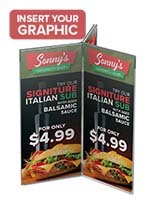 Buy this table sign in bulk quantities to have extra units on hand and to take advantage of the lower price breaks for larger orders.